This ?Baby-Boy Protect? 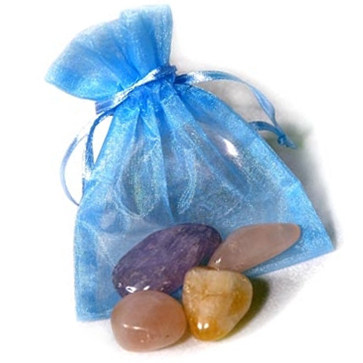 Pouch contains Rose Quartz, Amethyst and Citrine Tumbled Stones. Comes in Beautiful Light Blue Organza Pouch. Children will benefit greatly by these three stones. Rose Quartz, Amethyst and Citrine will enhance the positive qualities needed within your Child, helping and aiding them through their karmic path. These Crystals will work on many levels. A combination of these crystals contain powerful healing and energy vibrations. Not only are they beautiful as visual crystals, but they also hold within them a power that inter-relates to all around. These crystals speak, and when keeping them together and close to your baby, they will engage all their Powers to Protect your Child from Negativity and other Unpredictable situations. When Rose Quartz, Amethyst and Citrine are together, you will find their qualities both beautiful and helpful. You may use these ?Baby Protect? Pouches for a Newborn, infant or a toddler. Do not let the Baby to play with these pouches; just keep them under their crib mattress or in the diaper bag. A Great gift for Expectant or New Mom.